In this series, we are taking a look at how some users have adopted Alfred in their workplace. They'll give us a glimpse of how they use Alfred, how they stay productive and what it's like working for some of the companies we know and love. Here, Balthazar Simões from Campaign Monitor, shares how he uses Alfred while working with his very international team! Who you are? What keeps you busy? 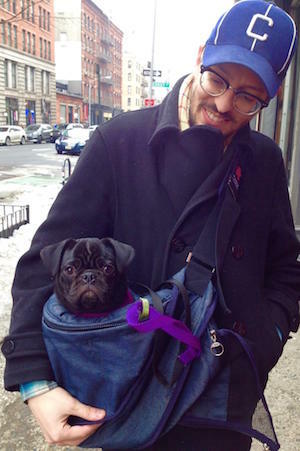 I’m the team lead for the North American support team at Campaign Monitor and I work remotely from Brooklyn, NY where I live with my wife and puppy, Ramona. My days are filled with managing our support queue, making sure our support folks have what they need, and solving problems for our awesome customers (like you!). Wow, maybe 2 years now? It’s hard to think of how I got by before Alfred! There’s no going back now. Alfred is like the perfect waiter: it waits there out of the way until just when you need it and then it appears, as if anticipating your every need. I don’t need to think about using Alfred; I don’t need to worry about it crashing or not working. Alfred simply does what I ask and then politely steps aside. There is simply no other app that allows me to do stuff so easily and effortlessly. Discovering workflows came way too late for me, but it has changed everything. Alfred was completely wonderful and indispensable before I dug into workflows, but it has taken things to a whole new level now. I began by creating a workflow to get my work day started. I have Alfred open some apps (HipChat, iA Writer, etc) and open a whole bunch of tabs in Chrome. There are so many things I need to check in the morning and it was way too easy to forget one or two before this; now I press a couple keys and know that my day is off to a good start. Trash downloads: Working in support my downloads folder fills up every day with screenshots and files. Now I can keep my downloads folder nice and clean. To really wow someone, I bring out the workflows. Showing someone that I can press ⌘ + ⇧ + C and a whole bunch of tabs and apps open up in an instant usually gets their attention. I like to show off the clipboard history as well because that little gem has saved me so much time and saves me a lot of worry. In April, the US remote team had a meetup in New Orleans (what a treat that was!) and I presented on Alfred and how I use it to get things done. A few people already used Alfred, but no one knew about workflows or some of the other features of Alfred that have become essential to me. The whole team is up and running with Alfred now and loving it. Thanks Balthazar for answering questions and giving us insight into your team life! We <3 Campaign Monitor!